Ageing is the result of biological events that progressively and irreversibly compromise the function of vital organs and eventually result in death. There is a general perception that ageing is accelerated in people living with HIV, with an increasing body of evidence to support this view. With the introduction of effective antiretroviral therapy, the life expectancy of people living with HIV has improved. Since people with HIV are living longer than previously, while also ageing faster than the general population, there is an increase in HIV-positive patients living with age-related comorbidities. This brief overview of ageing and HIV discusses aspects of the complications of HIV infection as they impact the ageing process. How diseases of age affect patients with HIV provides clues to help unravel the interactions between HIV and ageing that ultimately should help clinicians understand the basis of ‘normal’ ageing and manage ageing HIV-positive patients more effectively. In the past decade, there has been a dramatic improvement in the life expectancy of people living with HIV, as a result of effective antiretroviral therapy (ART) . This has led to an increase in the average age of HIV-positive patients, which presents new clinical issues with regard to ageing and the associated comorbidities . To date, the oldest known human lived for 122 years, but life expectancy in most developed countries is 80–85 years. However, even with recent improvements in the treatment of HIV, life expectancy for people living with HIV is well below that of the general population . The causes and limits of ‘normal’ human ageing are poorly understood. Defining the process, understanding the mechanisms, and using this knowledge to slow or reverse ageing is a field in its relative infancy. There is a general perception that HIV infection ‘accelerates’ ageing, with mounting evidence to support this view [3, 4]. A range of hypotheses exist for the presence of accelerated aging in subjects with HIV. These including reduced telomerase capacity, reduced somatic stem cell proliferation potential, and the effects of gut bacterial translocation. Aging may be also commonly seen due to lifestyle differences between HIV infected cohorts and the general population. 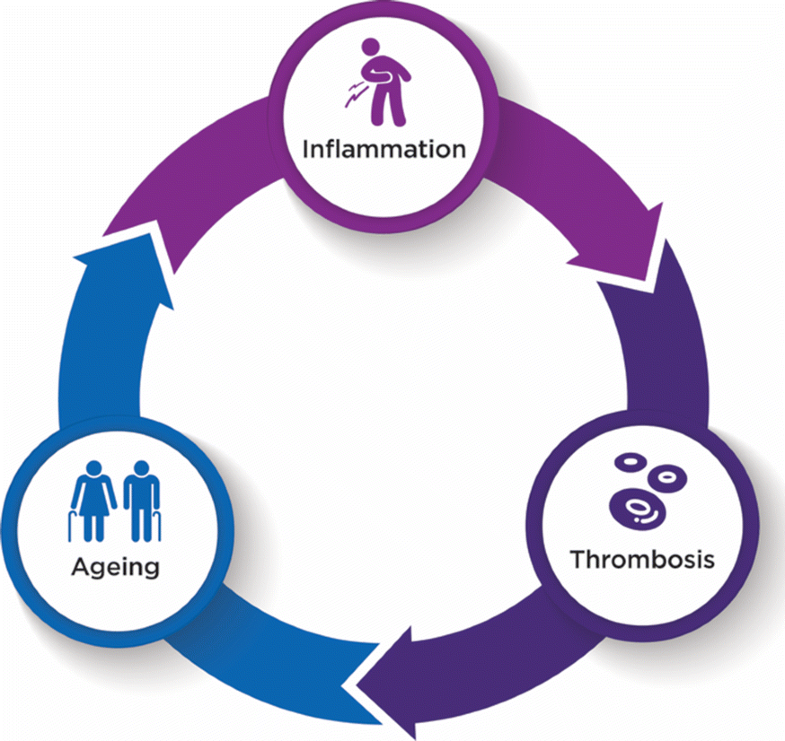 This brief review summarizes a recent symposium presentation in this field and focusses on the impact of hypercoagulation and micro-thrombotic events as they relate to ageing and HIV infection. The genetic basis of ageing is complex and no single gene or set of genes has clearly been linked to normal human ageing across the population [5, 6]. Numerous studies have identified metabolic and physiologic changes that occur with age. Creatinine clearance declines by approximately 30% between the ages of 30 and 80 . Similarly, cardio-respiratory fitness, as measured physiologically and expressed in metabolic equivalents, declines by around 40% from age 30 to 80 . Bone mass also declines progressively with age, at a similar rate in men and women, but men take longer to reach a fracture threshold due to starting with a higher bone mass . Rather than an inherent biological clock, the average rate at which individuals in a species age is determined by the level of organ dysfunction. This is a balance between the number and rate of dysfunction events, and the capacity of vital organs to tolerate those events. Over time, cumulative events compromise the function of vital organs, leading to age-related disease and, eventually, death. This is linked to the concept of frailty. One important reason for the progressive and often irreversible decline in organ function that occurs with ageing is a reduction in blood flow to the organ. The rate of liver blood flow, as reflected by the half-lives of liver-metabolised drugs, is reduced with ageing . Kidney blood flow, as reflected by renal perfusion, also declines with age . These combined effects have been shown to influence the reduced clearance of HIV drugs, such as lopinavir, as subjects age . Markers of inflammation such as C-reactive protein and fibrinogen show significant increases with age in otherwise healthy people . Inflammatory cytokines such as interleukin 6 (IL-6) and tumour necrosis factor (TNF) increase in arterial endothelial cells with age . Thus, ageing may be the consequence of cumulative inflammatory events that progressively drive thrombosis and irreversibly compromise blood flow and the function of vital organs, as illustrated in Fig. 1. HIV infection, even when appropriately treated with ART, is associated with at least a modestly reduced life expectancy . Historically, the cause of death in people infected with HIV was opportunistic infection. Chronic diseases associated with ageing are now a leading cause of death in HIV-positive patients [16–19]. The link between hypercoagulation, inflammation and adverse outcomes in treated HIV infection has become increasingly evident . In the SMART study, 5472 participants were randomised to continue treatment with their current ART or to discontinue treatment while their CD4+ count remained above 250 . Episodic ART significantly increased risk of death from any cause, compared to those who remained on continuous treatment. In this cohort of HIV-positive patients, cause of death was primarily related to diseases of age, such as cardiovascular, renal or hepatic disease, not opportunistic infections , and has been strongly linked to increases in the coagulation and inflammatory markers d-dimer and IL-6 . Cohort studies have identified that HIV-related ageing related disease is more common in the areas of heart disease, diabetes, neuropathies and thrombotic events rather than all organ systems . This lends support to the micro coagulation hypothesis. Physiological changes that occur in HIV-positive patients may be associated with age-related comorbidities. Carotid intimal thickness is increased in HIV-positive patients compared to HIV-negative patients . HIV leads to a ‘leaky gut’ syndrome, where higher levels of bacterial lipopolysaccharide and other bacterial products are present in the blood. This leads to increased vascular inflammation and is widely thought to underpin much of the excess morbidity and mortality in HIV-positive patients who are otherwise well . Inflammation levels are less in HIV-infected subjects virologically suppressed with ART but still abnormal and this may underlie the still substantial morbidity of HIV infection despite ART . With the ageing HIV population, we might expect an increase in small-vessel ‘vascular’ dementia associated with HIV in the future, although this has not been definitively observed to date. Cumulative toxicities from ART and associated medications are common in elderly HIV infected subjects . Renal impairment is common and linked to common HIV medications . Medical treatment of HIV infection and associated comorbidities such as cardiovascular and renal disease requires careful management by clinicians and dedicated pharmacists . HIV infection can be viewed as a model of accelerated ageing, with increased osteopenia, cardiovascular, renal and hepatic disease at a younger age . The differential effect of HIV on end-organ diseases of ageing provides clues to help unravel the interactions between HIV and ageing that ultimately should help clinicians understand the basis of ‘normal’ ageing and manage ageing HIV-positive patients more effectively. SK wrote the first draft of the manuscript. CF provided critical revision of the manuscript. A medical writer assisted with editing and formatting the manuscript. Both authors read and approved the final manuscript. Forum presentations: This report summarises presentations from the 2017 HIV innovation forum. Full speaker presentations can be accessed at http://www.innovationforum2017.com.au. (password: HIVinnovation). C.F. reports serving as a paid consultant for Cipla Pharmaceuticals, Janssen Pharmaceuticals, Merck Laboratories, Mylan Pharmaceuticals, and ViiV Healthcare, and received research grant support from Gilead Sciences paid to his University. This work was supported by Gilead Sciences. Gilead had no role in data collection, analysis or interpretation, and were not involved in the writing of this manuscript.